For all of the widespread change enacted and trumpeted by the Washington Capitals this offseason, a remnant of frustrating seasons past manifested itself in their season opener Thursday. 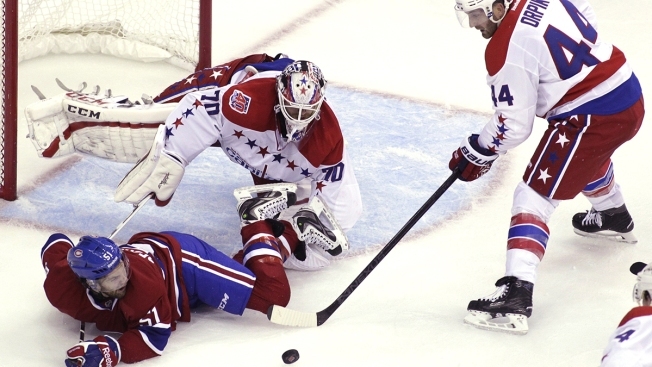 The Capitals, despite a spirited and occasionally dominant performance against the Montreal Canadiens, lost a 2-1 shootout decision. "Just couldn't get that second goal," defenseman Brooks Orpik lamented after the game. "Second goal is huge in this league." Realistically, the Capitals may have needed at least a third. Since the start of the 2011-12 season, Washington is 7-68-13 in games in which it scores two or fewer goals, the fewest such victories in the NHL over that span. Obviously, it was just one game and not necessarily a forewarning, but a lingering issue nonetheless. "Today's NHL, it's not that easy, players are too good," forward Nicklas Backstrom said. "It's going to be low-scoring games. That's the way it is these days. It's not going to be 7-1, 6-1, games like that." If one were to seek solace in defeat, however, the Capitals displayed a level of tenacity that has too often been fleeting. They controlled puck possession at an impressive clip, particularly in a first period that featured a 15-2 shot advantage. They forechecked aggressively, no better exemplified by the events that led to rookie Andre Burakovsky's first career NHL goal. Washington, as coach Barry Trotz had envisioned upon being hired in May, embodied the industrious, hard-to-play-against teams that routinely find success in the NHL. "The way you can judge sometimes is when the other team’s flipping the puck out of the zone all the time," defenseman Nate Schmidt said. "Our guys were in their face all night and I thought they did a great job of being able to get on that forecheck, being able to create havoc back there. Their [defensemen] didn’t want to get hit anymore by the end of the game." The Capitals' loss Thursday may have added another negative low-scoring result to a seemingly ever-growing pile, but they looked more well-equipped to handle that type of game than they have in some time. "As i said to our guys, I said, 'There's going to be games where we'll play really well and we'll lose. And there will be games where we don't play very well and we're going to win,'" Trotz said. "And that one was more on the 'we played pretty well and lost the game' [variety], a team survived and survived our onslaught. "You've got to be comfortable when it's uncomfortable. I thought we were pretty comfortable. If we did that 10 times in a row, that situation, I bet you we get it 10 times in a row."